If you are a local brewery or individual interested in participating, please contact branch manager Jeanne Cove at (215) 679-2020. Join us for our second annual Beer Tasting fundraiser! Tickets cost $25 and are now on sale. Get more information and RSVP on the Facebook event page here. Payments can be made at the library with cash or a check. Stop by during our regular hours, or mail your payment to 350 Main Street, Red Hill, PA 18076. Please make checks payable to "Upper Perkiomen Valley Library". PayPal is a Web site that accepts credit card and bank transfer payments. You don't need to set up a PayPal account. Your receipt will serve as your ticket, but once you have paid your name will be put on the list. 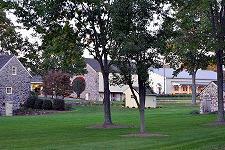 The Haines Estate is located on Geryville Pike in Pennsburg. Home of John B. Haines IV, the estate consists of the historic Andreas Reid House, a barn and tannery, and outbuildings housing the owner's impressive collection of antique vehicles and equipment. Directions to the estate can be viewed here.